As a graphic designer, I'm always looking for new and different color schemes and themes. and work perfectly together. Remember this photo from last winter? The muted hues of Lucy's fur against the snowy landscape made me want to drop everything and repaint every room in my house. Thankfully the snow melted and I came to my senses. reminds me of all the glory that comes to the desert with a few drops of rain. No, I won't be painting my walls with "Bovine Blue" any time soon. Good gosh, you REALLY took a hit!!!! I could totally paint with the first color palatte. Beautiful! Wow! You DID get clobbered! But it's such a good story. Proof once again that no good deed goes unpunished. Girl, you need some ARNICA! That and you need to stop being a good Samaritan. Good it´s just a colored eye and not broken bones. This cow was not kind.. maybe she has a baby or is going to have one soon. Oh, wow! That's a real shiner you have there!!!!! Once again, an unsuspecting reader is left on the floor and in stitches after scrolling down to the punchline... But, please, no more rodeo on foot & in the middle of a highway! To think that that cow could have knocked your sense of humor out of you - unthinkable! 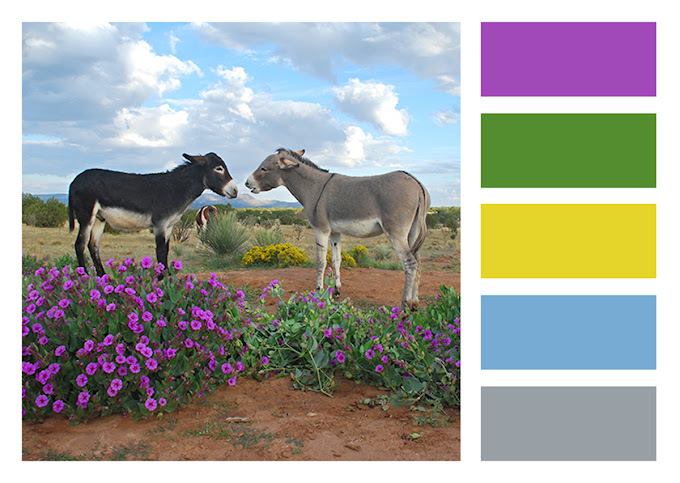 Wow, like the colors in your landscape, the colors in your eye will change daily, more "road kill yellow, less "bovine blue", before it gets back to normal. Love the color names. Thanks for sharing, hope your eye is back to normal in no time. Have a great weekend! It's just the explanation:" A cow did it". I guess a pair of Jackie Onassis sunglasses are in order before you go to Walmart shopping. OMG. Did that cow land her foot on your eye. That looks pretty bad. I hope it doesn't feel as bad as it looks. Next time, let the damn cow get hit....call the owner & BBQ it. My dear, you are a mighty independant, capable, strong woman but in a head to head with a runaway cow.....uhhhhh, cow 1, Carson, a good samaritan second. Your color names are so funny. The colorful flowered one is go vivid or go home and the first is wonderfully subtle and soothing. Ouch! That is quite the shinner. I am sure that had to hurt. 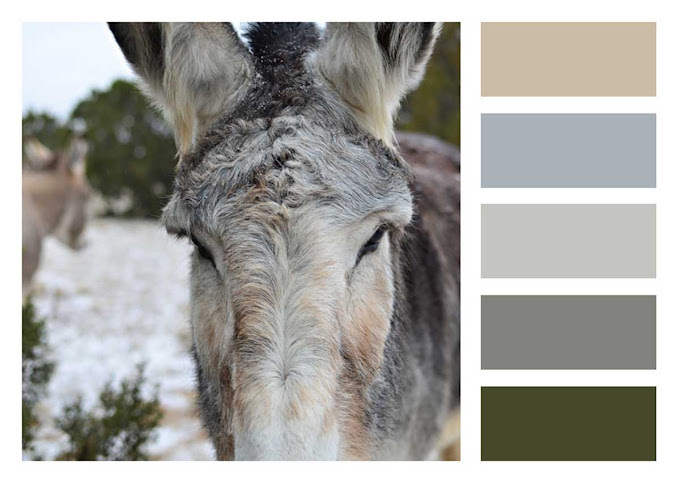 Love your colors and their names! A hit and run from a cow! New Mexico is such a wild, lawless state! WOW girl, you got it! Love the color combo though. Oh, thanks for being the sort of person who can make people laugh at their own foibles. I was so tickled by your post.... by your color swatches.... and their names! I do hope you are not hurting. Stupid cow...shoulda run the other way! Lucky I'd swallowed the coffee before I saw that last shot! Again you turn poop into meadow muffins with your wry sense of humor. Love the beautiful colors...especially that first one...so peaceful! Your eye..not so peaceful. I think you're lucky it wasn't worse. Cows are big, really big. Very impressive shiner you have there! Yikes. I like the way you slid that in there, too. Caught me completely off guard. I thought we were going to be talking about curtains or something. Nicely done. Now go put some arnica cream on that, for goodness sake! I love you bovine colors but not on the eye. Glad the eye is healing and you weren't hurt. 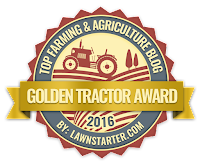 Leave the cows alone and to the professionals. This is called redefining beauty. IHA!!!! You're brave, Rancher Woman! Braver still to show us your black eye. I'm going with 'mad cow mauve'! Well, you just won't need to apply eyeshadow to that eye for a few days. Love your ability to laugh at something that must really be so painful. Little confused but I will go with Mad Cow Mauve. I gotta say, I love the Lucy palette! 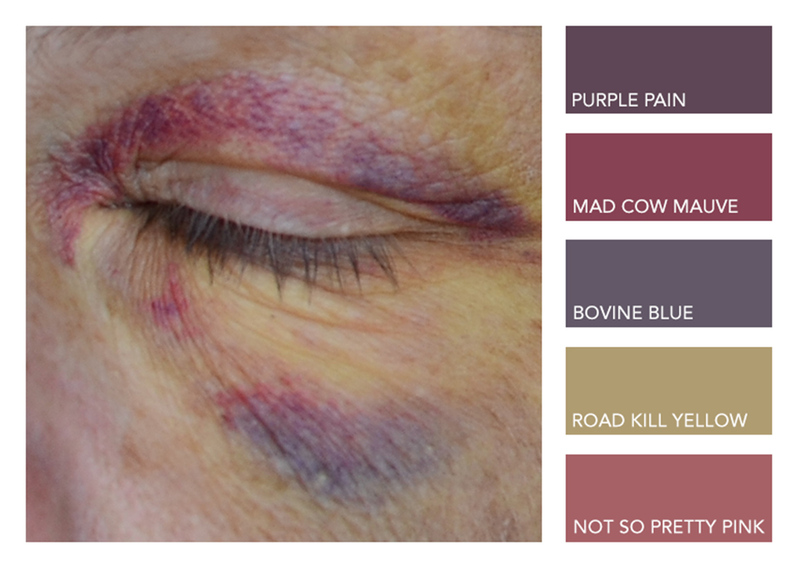 As for the bruise collection, I like the colors, but when worn around the eye, not so much! I hope it hasn't been as painful as it looks (I'm wincing for you). Yowza!! You really outdid yourself...those are even brighter colors than your recent arm laceration/bruising was! And the color names - hilarious! !